There are a number of things that can really set your home apart as something uniquely beautiful. It could be the counter materials you choose for your kitchen. 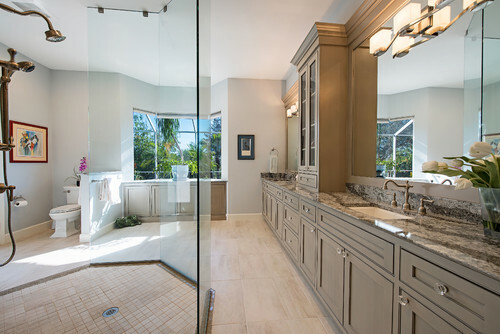 It might be the design of your Master Bathroom. It could be the flooring you select. But one thing that definitely makes a huge statement about the style and quality of your home is the use of built-ins. What makes built-in features so interesting and enticing is that they can come in so many different styles and be used in so many different places in your home. We thought it might be helpful to have a visual guide to different ways built-in features can be used to make your home more beautiful, functional, and distinctly yours. 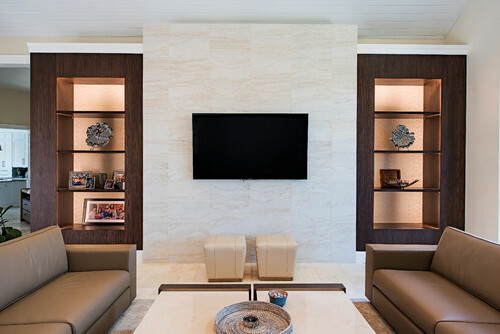 Here’s a look at some of the built-in projects we’ve worked on recently. The kitchen is obviously one place where built-in cabinets are on display. However, you have a lot of options for how to do that. 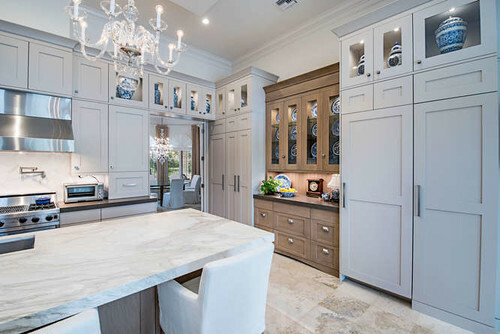 This Pelican Marsh luxury kitchen uses glassed-in cabinets at the top to show off a beautiful ceramic collection in an elegantly appointed kitchen setting. 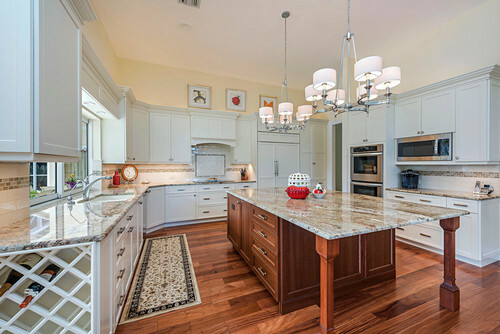 Click here to see other views of the kitchen and these exquisite cabinets. Sometimes, instead of highlighting objects, built-ins can be used to hide things. 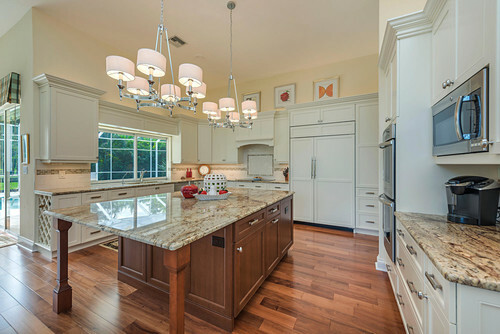 For instance in this Naples kitchen, rather than calling attention to an appliance, the owners chose to let the refrigerator remain out of sight behind cabinet doors—creating a brighter-looking kitchen. There are times when built-ins simply mean making the best use of the available space. 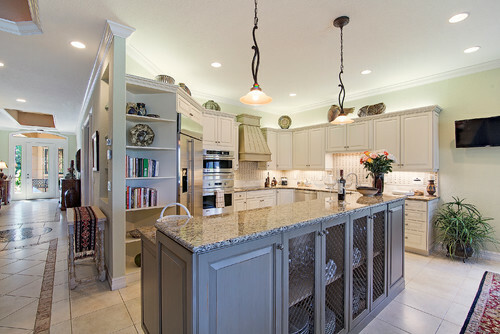 The wine rack at the end of the counter in this same Naples kitchen is a perfect example of that. It’s not flamboyant, but it’s an attractive way to display wines without taking up extra floor or wall space. Your built-ins can also work as transitional pieces in the kitchen. Here’s a traditional kitchen that uses a built-in bookcase to create a transition between the kitchen and the adjoining family room. It nicely blurs the lines between the two living spaces in this open floor plan home. The kitchen isn’t the exclusive domain for built-ins. They can be welcome additions to your bathrooms. This Pelican Landing master bathroom gives you an idea of how built-ins can work in your master bath. Storage is often an issue in the bathroom and the built-in cabinets you see here provide plenty of places to store everything imaginable; from cosmetics to soap, toilet paper, bath towels, and cleaning supplies. Cabinets aren’t the only things you can build into a room. The built-in shelves make a dramatic statement in this living room. In fact, they change the whole look of the room. Click here for a “before-and-after” look at the impact of this addition. If you’re planning on a home office or a study in your Naples home, you might be interested in what we did in this Naples home. By building the desk and bookshelves into the wall, this homeowner ended up with plenty of space to get away from the desk and read. It also makes this an inviting room in which to have a casual or private conversation without feeling crowded. 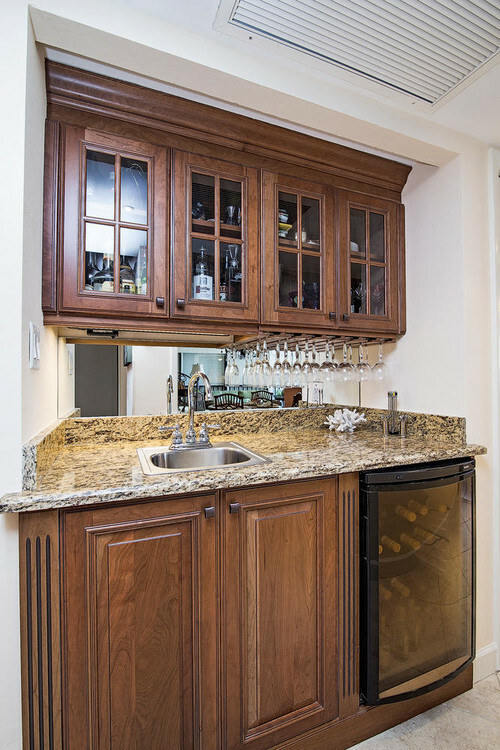 The built-in wet bar you see pictured here is actually in the kitchen we remodeled in a Gulf Shore home. But it could just as easily be built into the family room, living room, media room, or study. It offers plenty of storage and mixing space without taking up valuable floor space. We titled this particular post, “The Ultimate Guide to Built Ins,” but to be honest, this is just scratching the surface when it comes to building features into your Naples-area home. You can check out more examples here. Or if you have an idea of your own—but don’t know how to make it happen—we can help you with a design that will turn your great idea into reality.